We’ve been making some serious progress on our summer road trip plans. The flight to Seattle is booked and lodging is confirmed in all the National Parks, with cabins in Grand Teton and Yellowstone and small inns at the others. One notable and fun motel we found is the Flamingo Motel in Coeur d’Alene, Idaho. It has great TripAdvisor reviews and we always love an independent establishment. We chose the “Flamingo Beach” themed room if you’re curious. The general driving route is fairly well-established and we’ve discovered a few additional sites to visit along the way. Among them is Wallace, Idaho, site of the largest wildfire in US History, and Pompey’s Pillar in Montana, a rock formation named after Sacajawea’s son by William Clark (and the only place where the Corp of Discovery left physical evidence when Clark scratched his name into a rock). Another Lewis and Clark site of interest is an interpretive center in Washburn, North Dakota, near where they spent the first winter of the expedition with the Mandan tribe. While visiting Roosevelt National Park in North Dakota, we’ll be staying at Buffalo Gap Guest Ranch, which invites guests to bring your own horse (BYOH?). Since we won’t be hauling in our own, we will definitely be heading to Peaceful Valley Ranch to do a trail riding excursion. After North Dakota, the route back to Chicago could take many forms. Fargo makes a logical stopping point after leaving Roosevelt National Park, and we want to visit the source of the Mississippi River, Lake Itasca, in northern Minnesota. The fastest way home would be to then head south to Minneapolis/St. Paul for the night, but we’ve been there, so that’s not the most interesting option. An alternative would be to drive east from Itasca to Duluth and get a glimpse of Lake Superior. 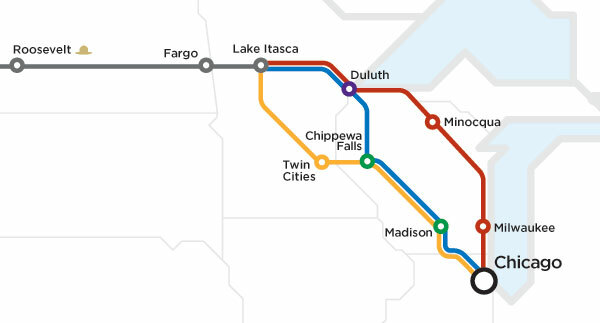 After that we’re torn … By turning south toward Chippewa Falls we could tour the Leinenkugel brewery and add to our Wisconsin beer experiences, or we could continue further east through the Northwoods and visit the island town of Minocqua. So many roads, so little time, but that’s the beauty of the road trip. We welcome suggestions from anyone who has traveled in the area! Plotting our options for returning to Chicago from North Dakota this summer. This entry was posted in Upcoming Travel and tagged Buffalo Gap Guest Ranch, Duluth, Flamingo Motel, Lewis and Clark, Minocqua, Pompey's Pillar, Seattle to chicago road trip. Bookmark the permalink. The twin cities are charming, if you’ve never been. Many times. We also stopped there on our 2009 Western road trip. Love the TC!